In spite of some conflicting data coming out of the US manufacturing sector in November (see discussion), the Markit manufacturing PMI is consistently showing signs of gradual expansion. Econoday: - The first half of December has been very good for the nation's manufacturers based on the PMI flash index which rose to 54.2, up a solid 1.4 points from the final index for November. A reading over 50 indicates monthly growth in business activity and a reading over the prior reading indicates a greater rate of growth. Details are solid across the report led by monthly acceleration in new orders which are up 1.2 points to 54.8. A special highlight is the index for new export orders which, following a long streak under 50, first popped over the breakeven mark last month and is now at 52.8. This suggests that foreign demand is on the mend. Other readings include a strong and sustainable rate for output and -- in a special positive -- a strong and increasing rate of employment where the index is at 54.4. Inventory readings show slight destocking which is ideal for future output and employment. Price readings are heating up especially for inputs which is consistent with the overall increase in activity. 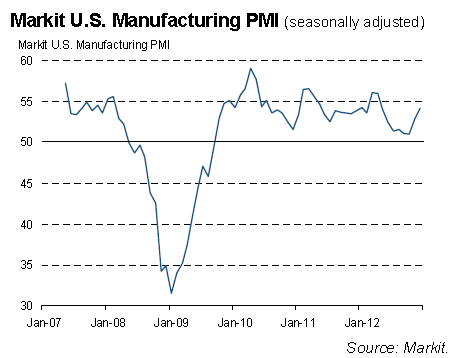 Markit: - The U.S. manufacturing sector is showing signs of regaining momentum as the year comes to a close. Producers reported the largest monthly increase in output since April, with the rate of growth picking up for the third month in a row, suggesting output is now growing at an annualised rate of around 4% compared to the contraction seen back in October. Such a steady run of improved growth of production is a good indication of a turning point in the economy as a whole, especially as it is feeding through to higher employment. The manufacturing sector has been acting as a drag on the official payroll numbers in recent months, but this situation looks to be changing as firms take on increasing numbers of workers in line with fuller order books. The next milestone is to see this trend confirmed by the ISM index (otherwise known as the NAPM Survey), which will come out in January. It would make no sense for the two indicators to keep diverging as they have in November.